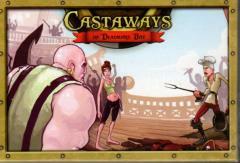 Castaways puts the players in the muddy boots of 3 eager pirates with aspirations to captain their very own ship. Gameplay is based around building up your attacks and tricking your opponent to defend against the wrong attack. A successful attack could push you off the plank, drop your health or force your crew to desert you. Either way you're shark bait if you can't keep up with your opponent. The duel is fast paced and mechanics are simple but strategies quickly form as you try to bluff your intentions while predicting your opponents. Younger audiences will find the duel fun and exciting while older audiences will enjoy the trickery when played with a clever opponent.